Planning a large-scale wedding on a tight budget is a challenge for even the most experienced planner. Making the most of a wedding, regardless of its cost, consists of three key elements: help your clients to set priorities, use resources that your clients have available, and be creative. Skip the Little Extras: Special touches like save-the-date notices, ceremony programs, guest favors, bathroom baskets, and monogrammed cocktail napkins certainly help to make a wedding unique, but will likely go unnoticed if they're skipped. One-time use items, such as special toasting flutes or a cake knife and server, are also entirely unnecessary. The caterer or venue will provide these at no extra cost. Don't Use Limousines: If needed, a friend can drive the couple wherever they need to go. Alternately, you might advise your clients to rent a unique car for leaving the reception; even at a couple hundred dollars, it's significantly less than a chauffeured vehicle (and if borrowed, the cost is nonexistent). Cut Way Down on the Flowers: Bridesmaids can carry a single, elegant stem or a tiny "kissing ball" instead of an elaborate bouquet. Groomsmen can wear boutonnieres of greenery rather than costly blooms. Tables can be made to look just as festive with centerpieces made of wrought iron-style candelabras (often less than $15 each) as they would with huge floral sprays. Less conventional decorative touches, such as branches or berries, can be just as elegant and striking as the traditional flowers would be, at a fraction of the cost. If the simplified décor is part of an overall event theme, no one will know the couple had a tight budget. Buy Used: There are so many wedding purchases that can be made secondhand, and considering most wedding items are only used once—and gently at that—you can get many things at a steal. Wedding attire can often be rented or purchased from specialty consignment shops, while community bulletin boards such as those on The Knot frequently contain posts from brides trying to unload everything from vases to votives for next to nothing. Almost everyone knows someone with a knack for making things. Perhaps the bride or groom has an aunt who's a fabulous baker; a traditional wedding cake may be too big a challenge, but what about cute wedding cupcakes? These are very trendy even at high-dollar weddings. A friend can be ordained online to perform the ceremony, saving anywhere from $300 to $800. Just be sure to check the legal requirements for officiants in the state where the wedding is taking place. A family member with a good printer and attention to detail can be recruited to create beautiful wedding invitations that cost much less than those from a professional printing company, and the more unique the style of invitation, the more it will seem like the handmade invitations were a creative choice, not a financial one. Finally, nearly every bride knows someone who is excellent at doing hair and makeup, even if not professionally. Keep the bride's look simple, and she'll enjoy significant savings as a result. It's easy to mind your clients' budget when you're willing to go "off the map" to find unconventional options for a wedding. Doing a wedding on a Friday or a Sunday—or better yet, a weeknight in the middle of the week—is a great way to save, and friends and family members likely won't mind. The contact at the venue may also be able to help identify some "hot dates" (in other words, slow dates) that are available for much less. Inquire about rental costs at unexpected venues, such as local universities and private schools; many have large banquet rooms or even dining halls that can be converted into a perfect place for celebrating. Another option may be a local lodge or even a fire station; some are more elegant in structure and appearance than others. When it comes to catering, you'll almost always save money for your clients by having the catering manager go directly to the chef for a custom proposal. Letting the chef weigh in on what's local, in season, and affordable around the time of the wedding can result in a menu that's more interesting and less expensive. A brunch or light lunch is also going to cost less than a full-scale dinner will, while another good choice is a late evening, dessert-only reception. If you do go the whole nine yards, you'll have to think budget. That means chicken or pasta instead of steak or fish, and skipping the dessert instead of wedding cake alone. Cut back on the passed hors-d'oeuvres as well, and supplement with a crudités display if needed. For photography, don't skimp on the artistic quality of the photographer. A wedding is supposed to be a once-in-a-lifetime event and provides a unique opportunity to capture beautiful images of the happy couple and their families. However, some money can be saved by skipping the expensive albums and hiring a photographer who will provide a DVD of the full-resolution images after the event. Music is a tremendously important part of a successful wedding, but hiring both live musicians for the ceremony and a DJ for the reception is budget overkill. 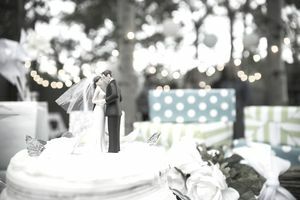 A reputable DJ will be happy to provide recorded music and microphones for the ceremony at little, if any, additional cost. Weddings don't have to cost a fortune to be beautiful if you plan wisely, think creatively, and stretch your clients' budget as far as it will go. So, You Want to Become a Wedding Planner? What Is a Wedding Coordinator?